First post and imagine it is a big one for the first. Last weekend I had some trouble with the coupe. I went to work and let it sit all day, and right now in north Alabama it is quite cold outside. I went to start it up and it took much longer than normal, drove home, about 3 miles, and started checking stuff out. After checking for fuel and spark I realized i had a possible BIG problem on my hands, and now the car wouldn't start at all. After trolling on here, asking a few guys at work, and talking to Tim from BR I found out it was time to replace my timing chain (and possibly more). I am apparently pretty lucky with 147k miles on my car for this to just be happening. 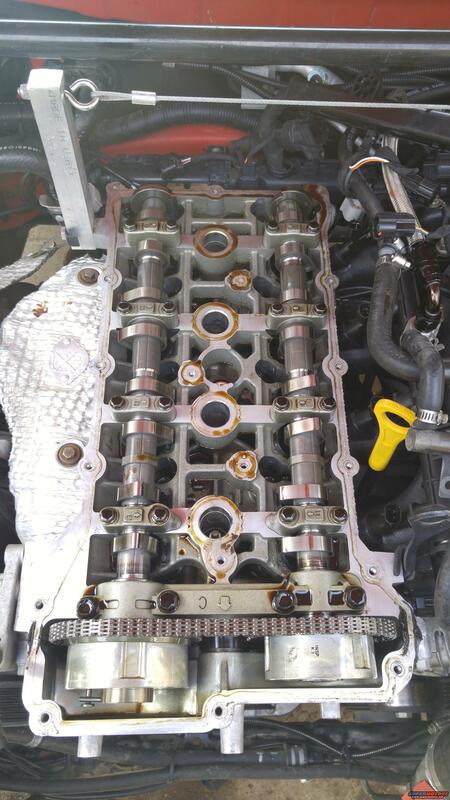 I haven't seen any DIY timing chain posts, so I thought I would create one. I am pretty mechanically inclined and the dealership wanted to break the bank so I figured I would do it myself. Any tips, tricks, or warnings are greatly appreciated. How did this end up coming out? I am about to start on my 2010 2L. So I started the chain change. I bought all new parts for oil pump and timing chain. But got the old chain. 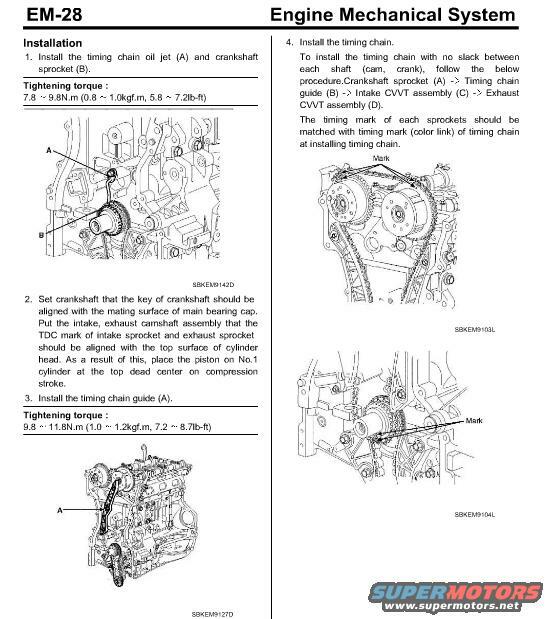 No need to take the engine out like the manual says. I did take the water pump pulley off and the PS pump. Both easy to do. PS pump has two mounting bolts. They are at 11 and 5 o'clock when looking at the PS pulley. Access through the holes. Valve cover comes off and loosen the bolts from the ends in and the center ones last. Reverse for installing. Then take out all the cover bolts and be sure you have them all out. In the center of the cover is one 12mm head and one 10 mm head below it. And the two for the coolant pipe sticking out. There is a 12mm head on the lower left that does not need to come out. No big deal if it does but it is for access to the timing chain tensioner with a special tool. See later post for pictures. The cams at 97k miles on Mobil 1, usually 0w40. And how much the chain is stretched, about a 1/2" deflection. This shows the intake cam advanced too far because of the stretch. 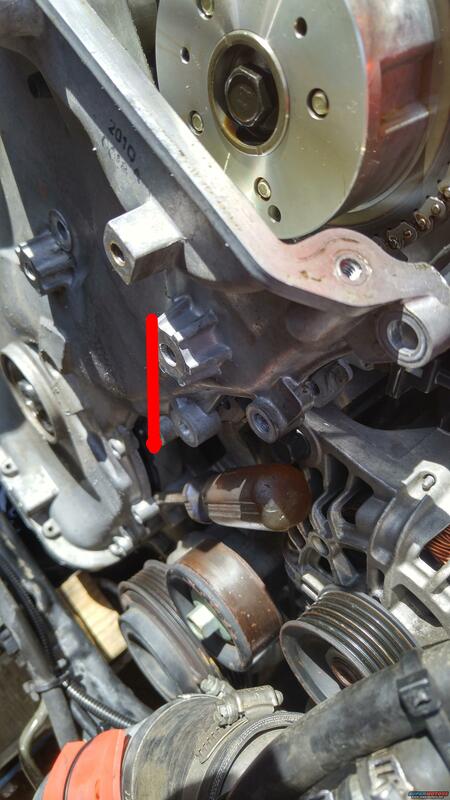 By the alternator there is a slot in the cover that you can get a screw driver in to pry the cover away. Start at the top to break it free then hammed a screwdriver into the slot to spread the cover. There is a pin on each side about 2/3s of the way down. Then work the cover twisting it towards the drivers side to break the oil pan seal. As you manually turn the motor over you will see the oil squirter is good or not. Sometimes the chain stretches too much and starts cutting it down. Chain tensioner out 4 notches. OE chain had marker links but they were the same color. Mine had WM3 stamped in them, I painted them white with some white out correction fluid to better see. Oil pump chain it was slightly stretched but really did not need changed, guides good too as well as the spring tensioner. So it's off to the store to get some gasket remover and start putting it back together tomorrow. Permatex 80645 foaming gasket remover. Odelagt and hdebnath like this. Last edited by Red Raspberry; 5 Days Ago at 11:40 AM. What Red means by "old chain" is the old style BK1 chain. The BK2 has an updated better chain (or was it the 4B11T?). IIRC they are interchangeable and just different in how the links are stacked. I've been waiting for time to machine the rest of my head to fit the 11mm lift tomei cams that I have. So after getting the special gasket remover it says in fine print not intended for silicone gaskets..... Found out the best is some Gunk Original Formula engine degreaser aka diesel fuel. Brake cleaner works too but evaporates too fast. Good for rinsing though. A small steel wire brush worked great, get them in a welding area at the hardware store. Also the oil pan has a little sump area under the pickup that does not drain when the oil plug is out. So I first ragged out what I could then flushed with some gasoline, then ragged that out and will let it evaporate over night. Then I will pre fill the pan with a couple quarts from the front. When setting the engine to TDC on number 1 I put a long extension or wooden spoon into the spark plug hole then rotated the motor ClockWise. I marked the crank pulley with some white out but when you have the pulley off you loose your reference. Hyundai was nice enough to put a mark that equals the crank pulley mark and is straight down when at TDC. A mirror laying down on the front of the pan and you can line the white dot up with the oil that is draining down dead center on the face of the block from the chain oil squirter. Tools I've used are a 1/2" breaker bar, socket wrench, air impact and 22mm socket for the crank pulley. You will need a pulley puller too and when it comes off don't loose the key because it will fall out. Key slot is at about the 9:30 position when engine at TDC. The rest is just screwdrivers, prying tools , flexible scraper, 10mm and 12mm sockets. You will need some solvent to wipe every thing down with before you start the glue up. And have some top of the line sealant. The sealant does not have to be thick and most will be squeezed out to an extremely thin layer once torqued down, about an 1/8" bead. Be sure to circle the bolt holes in the middle of the cover and the water tube outlet then a bead down the center of the cover mating surface. Almost all the bolts I took out had sealant on them so they must squirt right down the middle of the cover, robot probably. 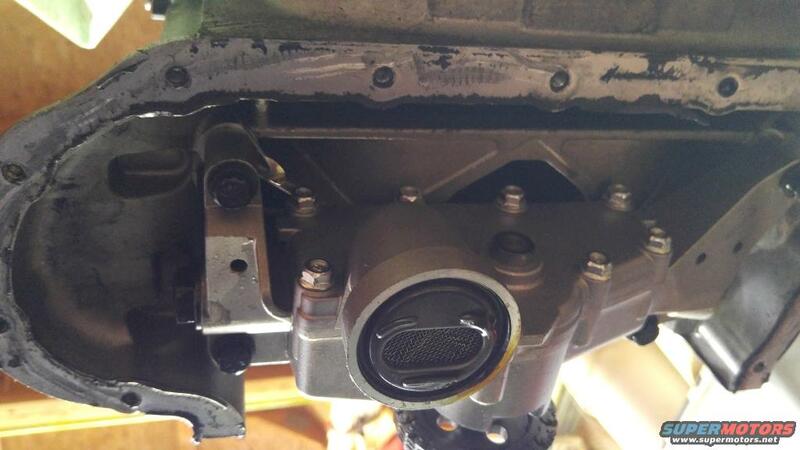 The oil pan squirt a little extra where the pan/cover/lower block meet. 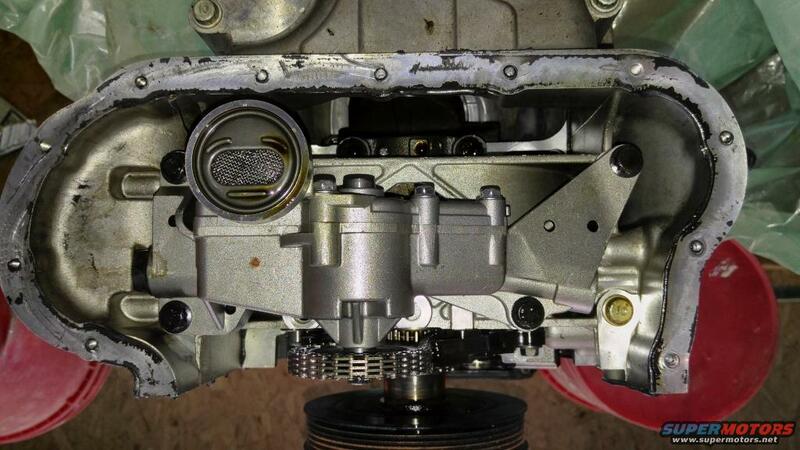 Also where the lower head and cover meet and on top where the valve cover/timing cover/head meet. Do some try fits with the cover before putting any sealant down. And don't let the sealant skin over before putting in place. Try not to slide it though the last 1/4" or so over the pins will have to be slide on. My stuff says hand tighten then torque after an hour. Last edited by Red Raspberry; 2 Weeks Ago at 12:38 PM. I used a clean floor scrapper blade (basically a 4 inch long razor blade) and then a 120 grit fingered rololock disc to clean the what didn't come off. A lot of engine builders use the disc to clean the top of the block, but use the yellow 80 grit. I used the white 120 grit, because I didn't want to risk taking too much off in one spot if I got careless. hondabond is what I have been using for decades for gasket sealer. Never had an issue with it. A lot of nissan and GM mechanics swear by it. For people doing this yourself, you should really replace the front main seal as well since you have the front cover off anyways. Note which way the seal goes before removing it. Good idea on the front seal. No better time to change it and they are not expensive and can be found at most parts stores. I picked one up last night. An 1&1/2" SCH 20 PVC pipe coupler makes the perfect instillation tool. Didn't get to far today. Back is hurting. Got the seal installed. Put some sealant around the outside edge and it just pressed into place with my hand. It popped back out though on it's own so I had to weigh it down until the sealant cured. Got the oil pump chain and guides back on. I would skip this if not obviously needed. None of the guides appear worn as well as the tensioners. 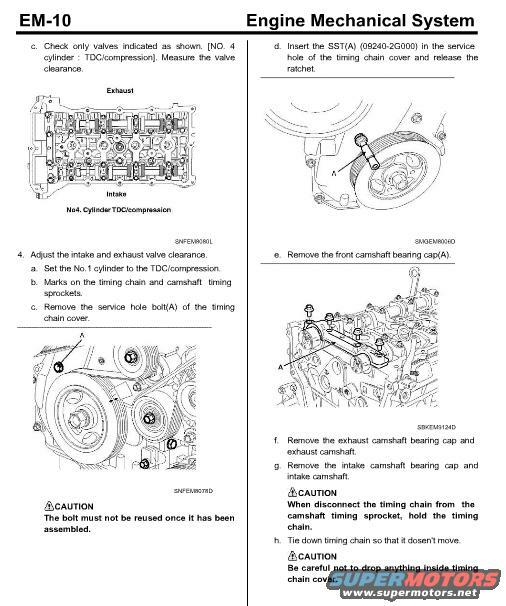 Most could get by with just a timing chain change I would guess if the engine has been properly maintained. If you do change this out I took the pump gear off. You will want to put the chain and gear on before the guides or tensioner or getting the gear and chain on is near impossible with them in place. The cams have two white dots on them where the marked links go. And when the cams are in the the proper TDC position there are two horizontal lines on the cam phasers faces that line up horizontal in the middle. 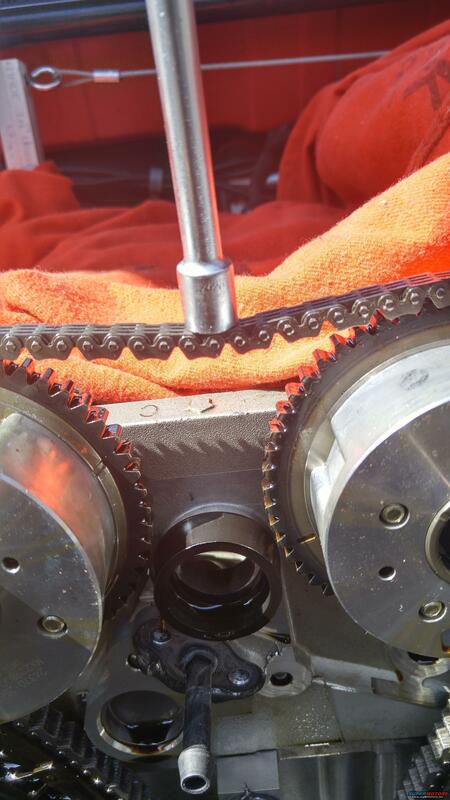 I marked them too with white out as well as the small white dot on the bottom of the crank chain sprocket. A mirror is needed to be sure the crank is in the proper position. I had to lock the intake cam in the right position with a screwdriver wedged under the number two cylinder intake cam lobe. Exhaust cam will stay where it should on it's own. You can turn the cams with a 1&1/8" or 23mm wrench neither of which I have. But ai had a crescent wrench that fit. Had a hard time with the oil pan clean out. It may be better to take it off if you plan to do this as no way can I be sure of getting all the little bits of gasket out. I flushed a half gallon of gas though the oil pan then mopped up what would not drain from the front of the pan and let it all air dry. Remember to crank the crank 4 full turns before putting the front cover back on. The cams should be back at their DTC positions after 4 full crank turns. This will let you know if your supplier gave you a good chain or not. 99% of the time it will be good, and it's just good practice to check. So ready to put on chain as said in the manual. Crank at TDC (white spot on chain sprocket straight down) and the two cams generally lined up with the small line even with the head (nice cast mark on the head to line it up with). 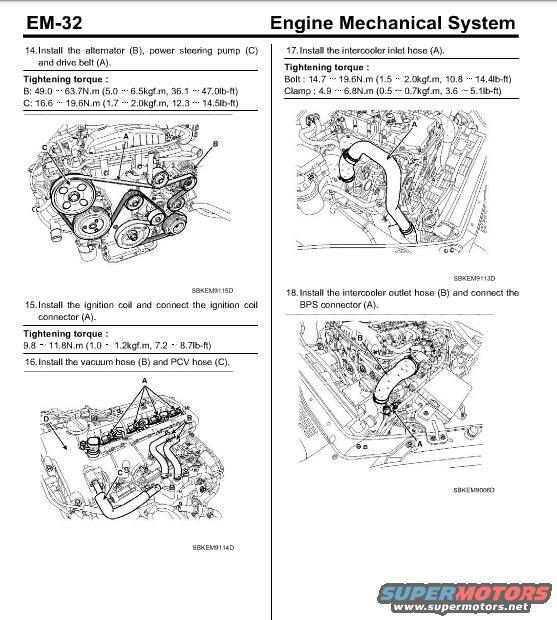 Then manual says install tensioner guide (not tensioner, it's last). Then put chain on crank sprocket with the chain link matching up with white dot. Then up to the intake cam. I had to manipulate the cam to get the chain in the right spot. Then on to the exhaust cam, had to manipulate the cam there too. Then put the tensioner on. Then put the fixed right side guide on. But check again as the crank sprocket will have some chain slack before the tensioner is let loose. May have to hold the chain on the correct spot at the crank sprocket before pulling tensioner pin. I then dumped a couple quarts of oil in the pan so the oil pump would prime as I hand turned it. 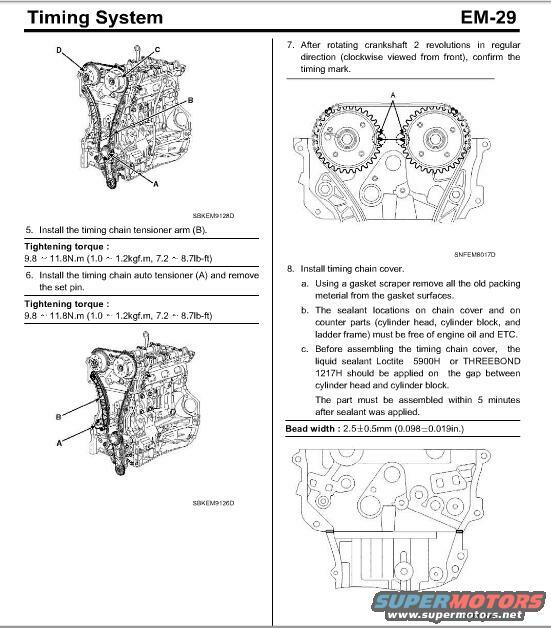 Then the manual says 2 complete revolutions of the crank shaft in a clockwise direction and the marks should all line up. No way. So I tried 4 revolutions still no way. I have to do 20 revolutions to get the marks to match up again. Am I good to go???? Last edited by Red Raspberry; 2 Weeks Ago at 11:41 AM. The two revolutions is the cam and crank marks not the marks on the chain. The marks do line up at two revolutions and the chain links line up after 20. All buttoned up now. There are three bolts that go on the center of the cover. One short and long 10mm and one 8mm Two have bosses on the block and one short 10mm goes on the left side in the center. I put sealant on that one as it threads into a panel on the other side of the cover. The hardest part in putting it on is aligning the two pins and the water tube. It all pops on after you get the water tune started. Do not forget to put sealant on the two inner bosses and the water tube area. I don't pay attention to the chain markings, except when first setting timing, since all that needs to be in sync are the cams in relation to the crank. 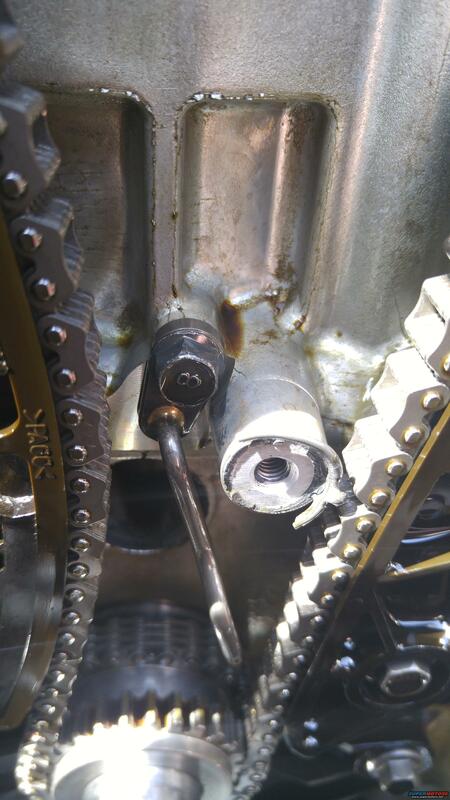 If the cams aren't where they're suppose to be after 4 crank rotations, then there is obviously something wrong with the chain. Edit: I should have said before that once you gasket front cover up, bolt it in loosely. 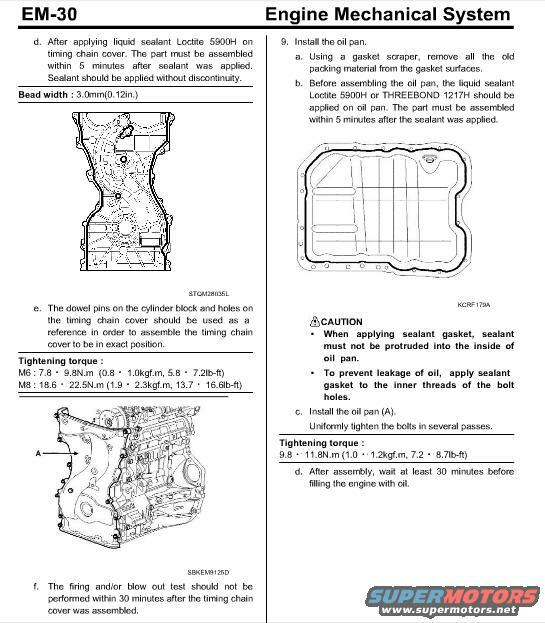 Lightly bolt in the valve cover and the oil pan., Then loosely tighten the corresponding bolts. 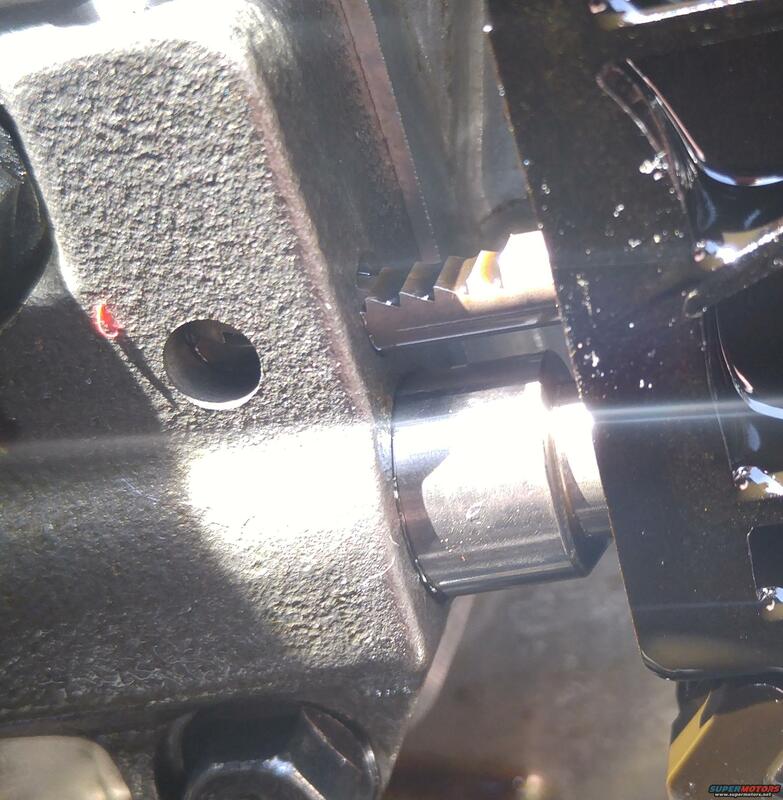 Then tighten the relevant bolts in the proper torque sequence. Then let the sealer cure. I do it this way, to help locate the front cover in relation to the block. If you're remounting the ladder frame, I put sealer on the latter frame, and bolt the front cover to the block without sealer and use it to help line up the ladder frame to the block. Then do what I described above. Last edited by AKGC; 2 Weeks Ago at 03:17 PM. I didn't take the engine out of the car or drop the oil pan. When putting the cover back on you need to pivot it slightly from the drivers side to the passenger side after getting the water tube lined up. It then slips into place easily. I mentioned the short bolt that is did not need to come out. Here is what it is. The isntrutions say to no tuse it twice but I 'm sure they mean the tool that is used here. 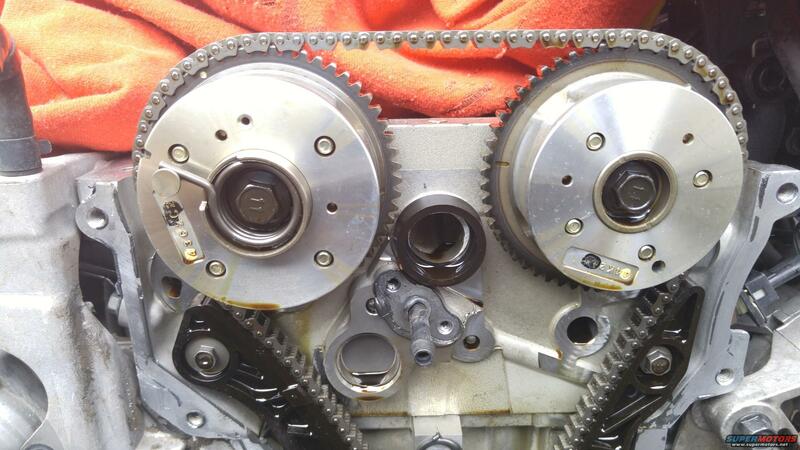 It's an access hole to relive the timing chain tension without taking the cover off. Filled it with fluids and brought it up to temp. Letting it sit now to see if any leaks. Can't drive it till the 15th anyway due to no insurance. I found it pretty easy and non messy to apply the sealant to the block and front of the oil pan. Still the issue is getting the water tube started through the cover first. And only put sealant on the front of the bolt holes of the oil pan as you will slide that on. Be sure to apply some sealant to where the three bolts (2 10mm, 1 8mm) thread into the block. And around the water tube on the block. There also is a large rubber ring that goes between the head and cover in the center of the cams. This is to direct excess oil down the front of the timing cover. It has a special panel inside. Nice for oil cooling. If I did this again I would take the oil pan off. It looks to be easy. Re-seeing this and comparing it to the 4B11T head, thinking about machining something to retrofit a 4B11T top chain guild. Couple of pics of the oil pump with pan removed.